This pot has onion sets in a double row around the terra cotta resevoir. A 4" pot with salad greens goes inside it. I did pay for one liner, from gardener’s supply, and thought about making more with bowls, and mesh, and PVC pipe…the whole idea made me tired. Then I saw these terra cotta vases at Hobby Lobby- about 6 inches across, 10 inches tall, no drainage hole in the bottom, but unglazed, so they are porous. They hold about 2 liters of water. I bought one to start, and put it in a 14 inch pot, and put geraniums into the pot. They did great. The soil stayed evenly moist, and I was able to put a smaller pot on top of the vase, too. Roots dangled into the water from above, and water continually seeps through the pores of the terra cotta. 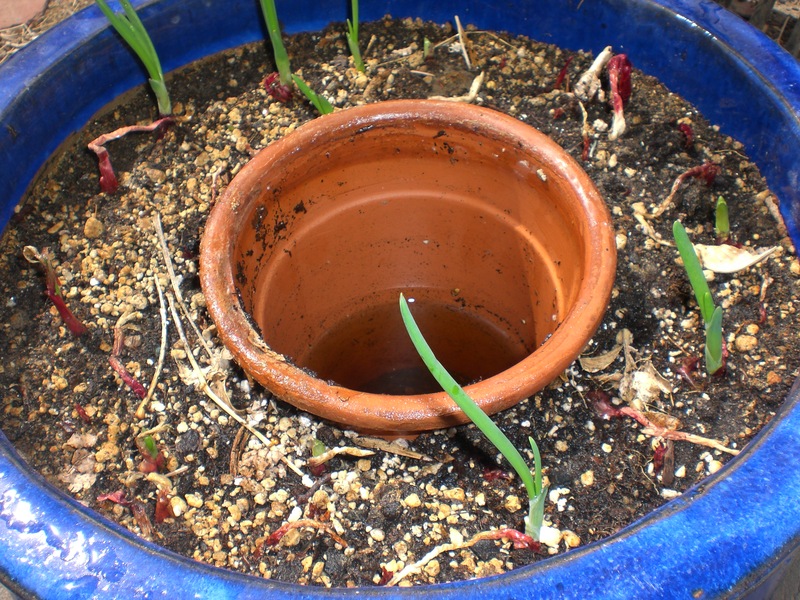 If you pour a half gallon of water into the soil of a regular pot, most of it drains out the bottom, and you need to water again the next day. Under my conditions (arid west, bright sun, YMMV) I can fill the resevoirs once or twice a week. I now have 3 or 4 of the vases- they aren’t great for everything, and they need to be covered with either a plant or a saucer so mosquitos don’t breed in the water. I have read about them being used in raised beds, also, but have never tried it. If your craft emporium doesn’t carry them, check thrift stores- I’ve seen terra cotta wine coolers every once in a while that would work pretty well, I think. Nice to see your double clay pot! Dry Lands Research Institute, Riverside, CA 3 p.
Bainbridge, D. A. 1988. Pitcher irrigation. Drylander 2(1):3.
transplant establishment. Native Plants Journal 2(1):25-29. Portland, Oregon. ASABE #062073. St. Joseph, Michigan 10 p.
Balakumaran, K. N., J. Mathew, G. R. Pillai, and K. Varghese. 1982.
watering in cucumber. Agric. Res.J. Kerala. 20(pt2):65-67.
pitchers. Indian Journal of Agricultural Science 53(5):380-382.
and Subtropics. #66. 174 p.
Cheers to you- I somehow thought I had invented it, but then I started researching it and found that it is old technology. Thanks for stopping by! I cannot express how seriously thrilled I am to have found this idea! I’ve been struggling very much with figuring out how to make home-made self-watering pots in the cheapest most recycle-friendly way possible. I LOVE your example of an “inside-out” self watering pot. I’m so doing this asap. ps. I, too, had only discovered recently that un-fired clay jugs without handles can be used to deep-water plants when it is buried up to the neck in the garden, by just adding water in to the top. Apparently this is an old-fashioned way of doing it, but I think it’s fantastic! The water just seeps through the clay just right apparently. I was unable to find clay jugs that weren’t fired, and they were all horribly expensive – your clay pot idea is perfect to me! I meant un-glazed clay, not un-fired clay ~ Oops, I was so excited ! Thanks again, really fabulous idea!